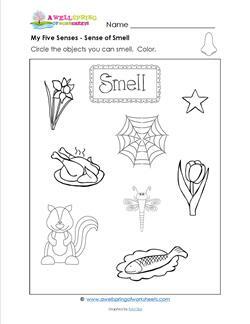 These five senses worksheets help kids identify things in their environments they can see, hear, touch, taste, and smell. Each worksheet covers one sense. Kids circle the objects on the page that can be experienced through that sense. 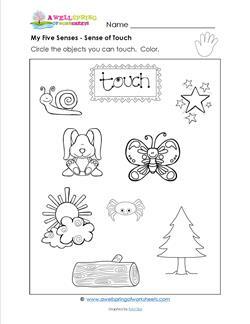 Have kids identify what they see, how touching an object might feel, a sound they might hear, if an object can be eaten, or if an object has a particular smell. You’re sure to get some exclamations out of some of the pictures! 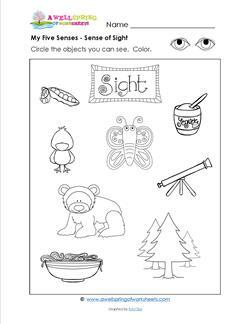 Please go to this page to choose from all the senses resources on this site. 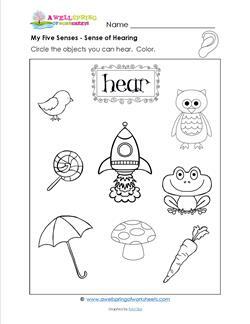 My five senses include the sense of hearing. Which of these objects or animals makes a sound that you can hear? Circle those objects. Can you make the sound they make? Color away! Our five senses include everything you can see. Circle the objects on this page that you can see (hint: everything on this page!). Color all the objects, including the pair of eyes. We experience the world through our five senses. Take a look at these objects and circle the things you can smell. Do they smell good or bad? Color just the things you circled or all of the objects. Here's another one of the five senses - the sense of taste. I think this might be some people's favorite sense! 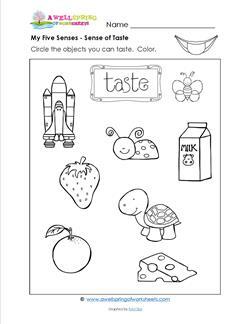 Look at the pictures and circle the items you can taste. What do they taste like? The sense of touch is one of the five senses. We use our hands and all of our skin to touch and feel things. Which of these items can you touch? Describe how they feel. Color the pictures.